News of this weekend’s Legacy Fighting Alliance event in Vail was first greeted with some raised eyebrows. 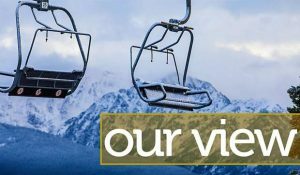 After all, what does mixed martial arts fighting have to do with Vail’s brand as a family-friendly resort? Still, the Vail Commission on Special Events last year approved helping the event with a $17,500 contribution. The raised eyebrows in the valley included commission members and members of the Vail Town Council, but both those boards ultimately agreed the event is a wise use of public funding. First, the town’s contribution isn’t funding the entire event, just helping with up-front costs. Second, the town events commission’s job is to help establish events that bring people to town, preferably in “need” times, spots on the calendar that could use an infusion of visitors. If Friday, May 4, isn’t a need time, then what is? The town has indeed become more busy outside of ski season — which still generates more than 70 percent of the town’s sales tax revenue — but spring and fall remain a tough sell. Yes, corporate and municipal groups come in May and October, in no small part because they can land much-better-than-Denver lodging rates. Still, with the exception of construction equipment noise, it’s mighty quiet during those months. Friday’s event promises to bring hundreds of fans — most of whom are 40 or younger — into the heart of Vail on a usually empty night. A lot of those people will make a night of it and are likely to stop somewhere for dinner and/or drinks before or after the event. Beyond the immediate, refreshing influx of people — some of whom may come from outside the valley — the event also will be broadcast live on AXS TV, a cable channel with a young-trending audience. That means viewers will get a good look at the town on what’s forecast to be a sunny spring day. Putting new eyeballs on any resort town is almost always good news. So raise an eyebrow if you will, but after years of trying, and failing, to secure a successful May event in Vail, let’s see what the Legacy Fighting Alliance may bring.